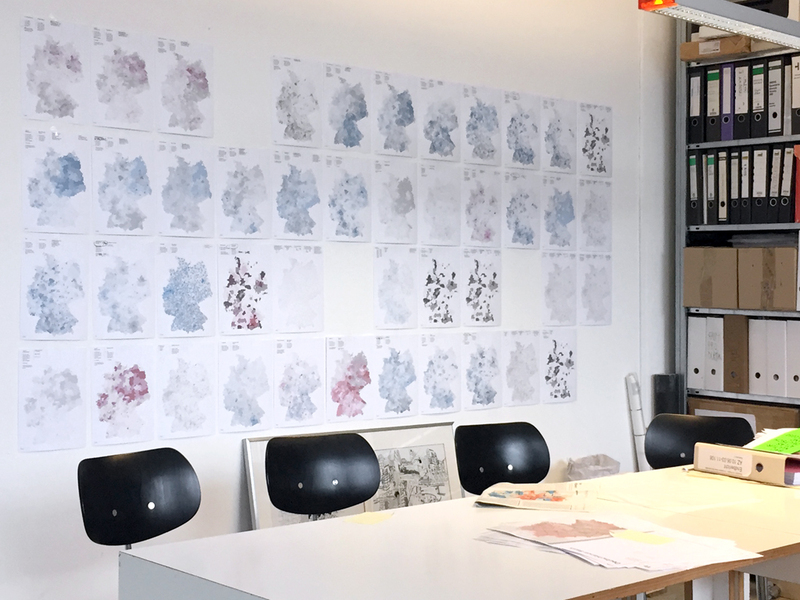 How will social conditions affect Germany’s built environments? Under which conditions are cities and regions changing? How are we going to live? 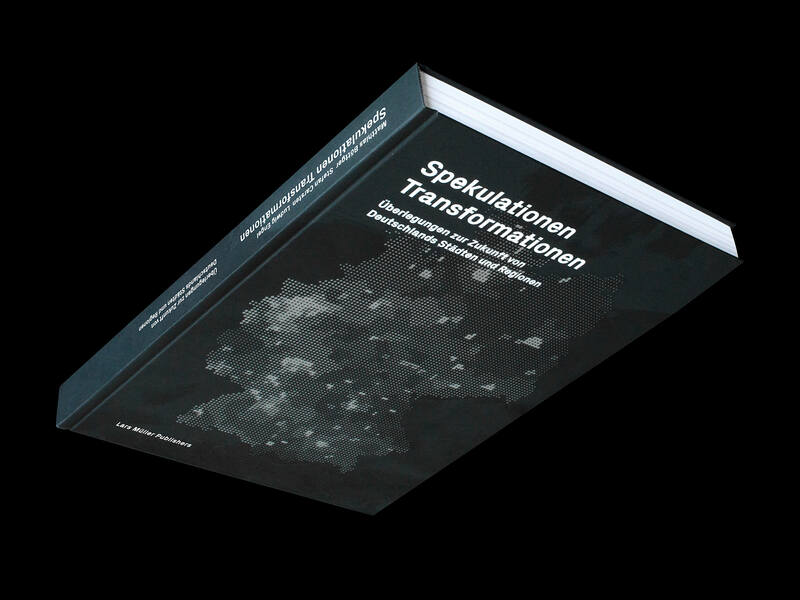 The book Speculations Transformations is dedicated to the Future of Germany’s Cities and Regions: an atlas of Baukultur composed of texts, maps and photographies that drafts scenarios about the spatial, natural, urban, architectural, and social environments in which we might live in 2050, after having faced economic and infrastructural transformations. 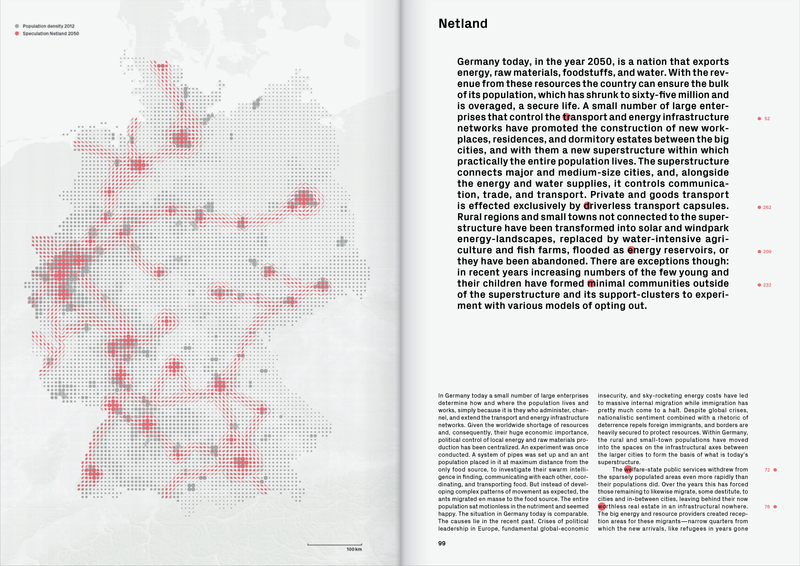 Speculation Mapping: Netland – The superstructure connects major and medium-size cities, and, alongside the energy and water supplies, it controls communication, trade, and transport. 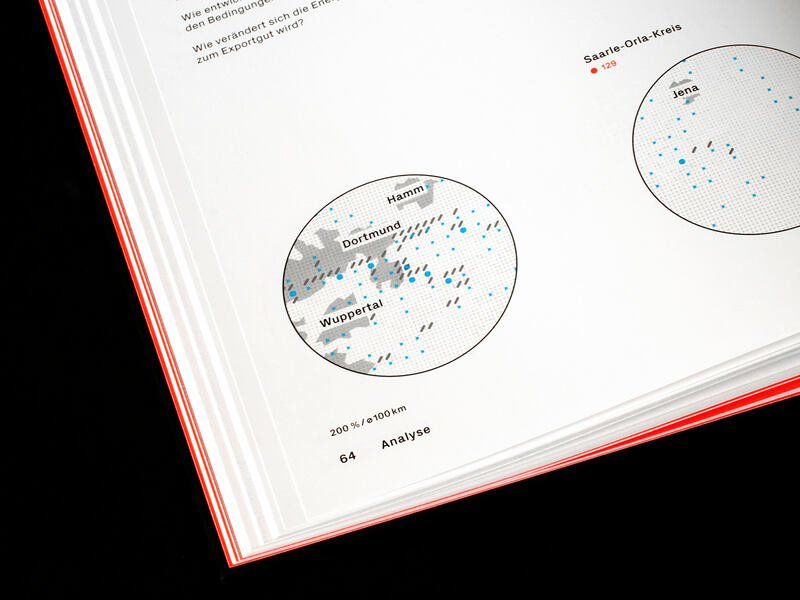 While being separated within the book, texts and data are at the same time connected by a subtile system of mutual references between both parts, based on neon-orange dots covering the pages. 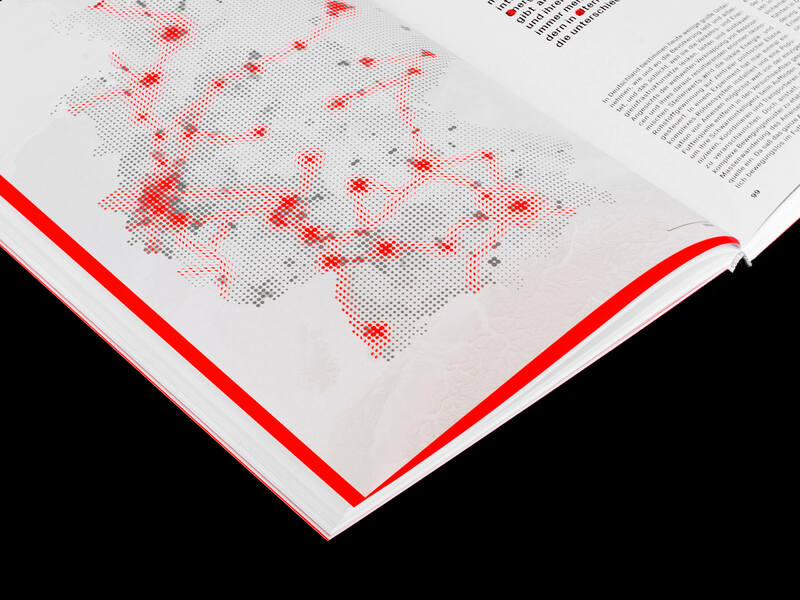 For ANALYSIS we developed and designed a series of maps and infographics facilitating a better understanding of the present, while subsuming SPECULATIONS about the changes of cities and regions cartographically as Netland, Wattland and Integralland. 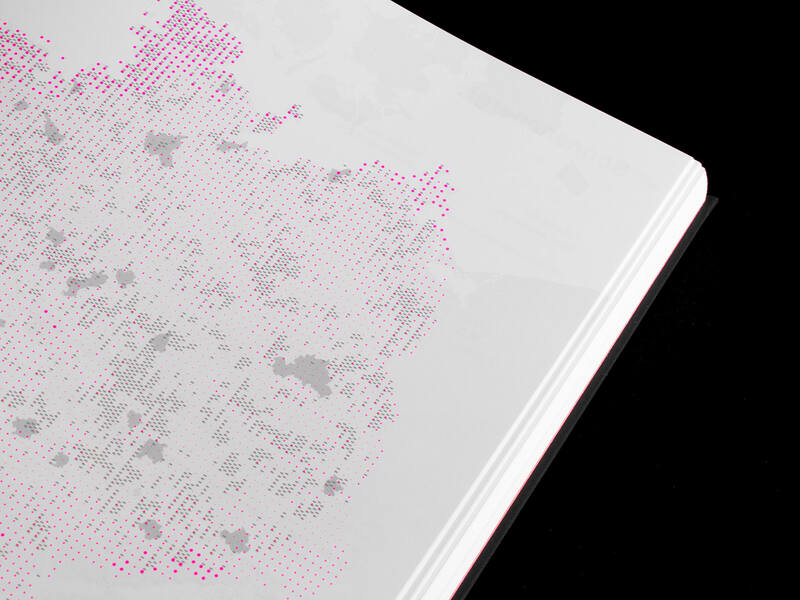 Therefor, we defined a system of representation for the depiction of the blurry, and a visual language and vocabulary displaying the underlying theses and discourses aesthetically. 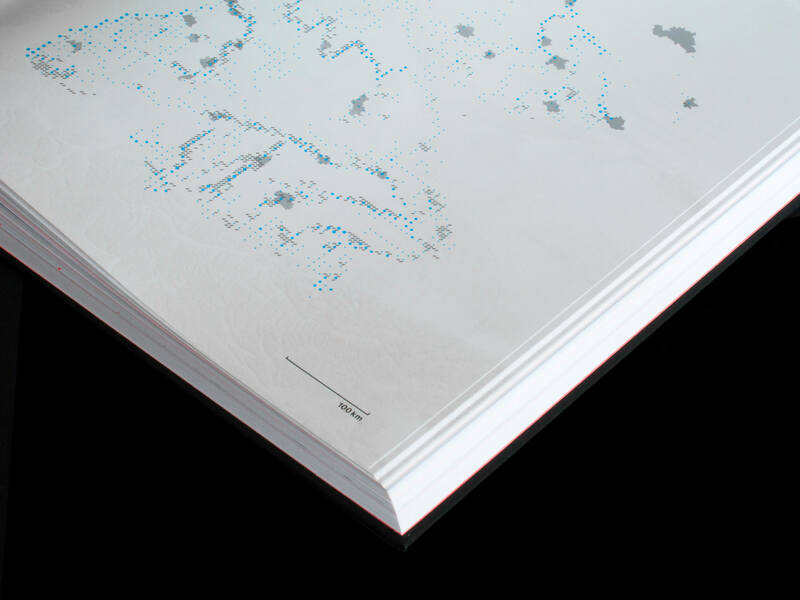 We simplified complexity and subsumed diverse levels of texts, illustrations, data, photography, and their interrelations in a layout that guides you through ideas and thoughts of how we are going to live in 2050. 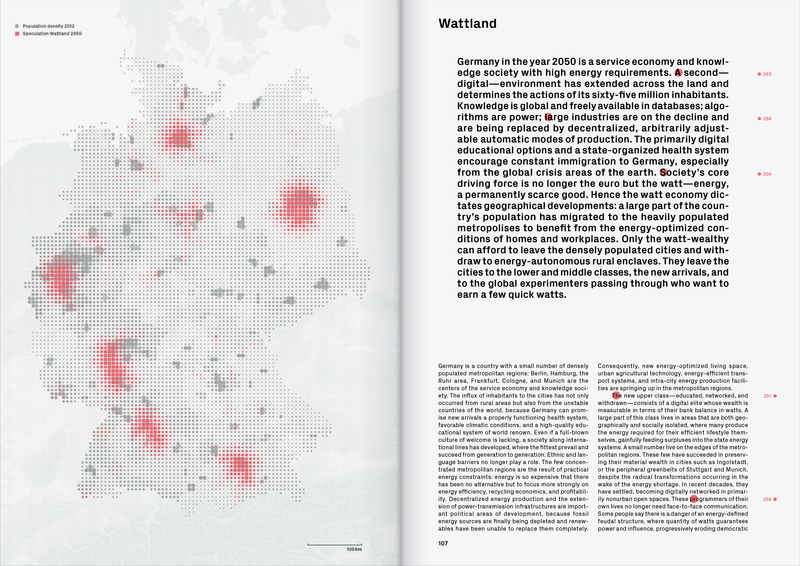 Speculation Mapping: Wattland – Society’s core driving force is no longer the euro but the watt—energy, a permanently scarce good. 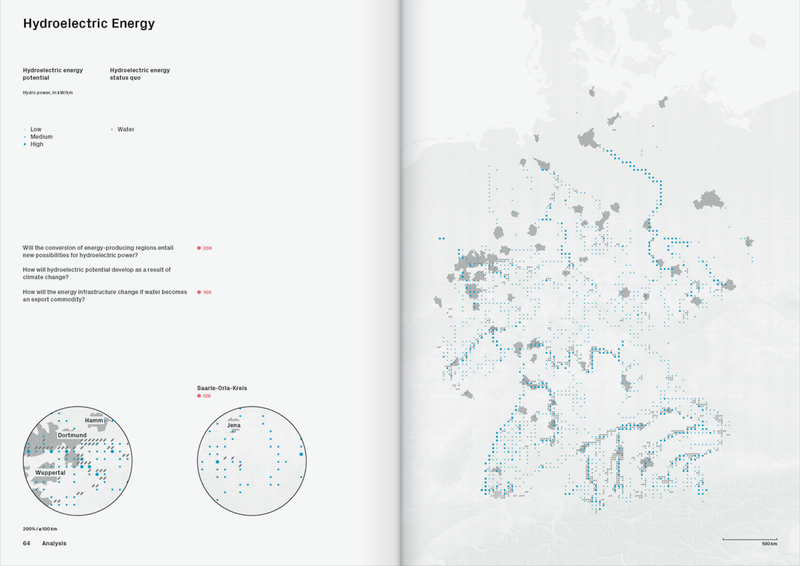 Hence the watt economy dictates geographical developments: a large part of the country’s population has migrated to the heavily populated metropolises to benefit from the energy-optimized conditions of homes and workplaces. 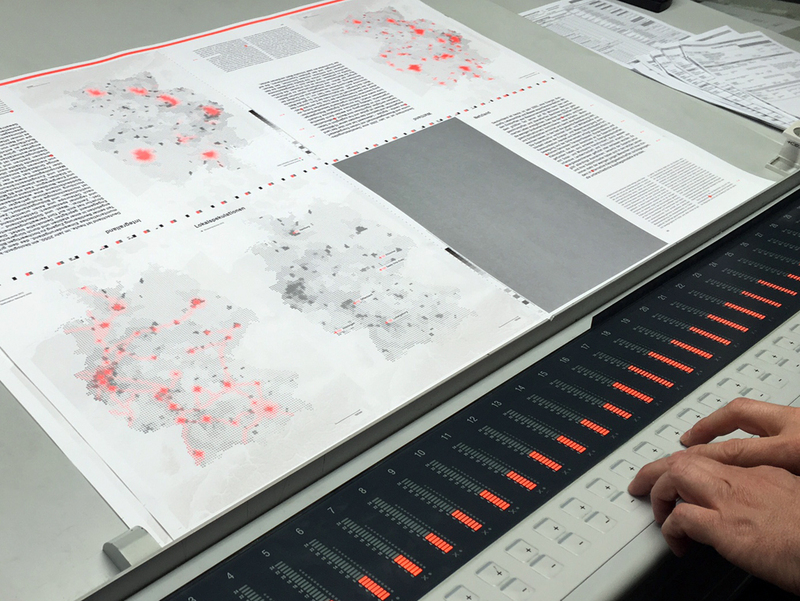 How can statistical data be represented and localized to facilitate a better understanding of the present? How to deal with the status-quo as a basis layer? 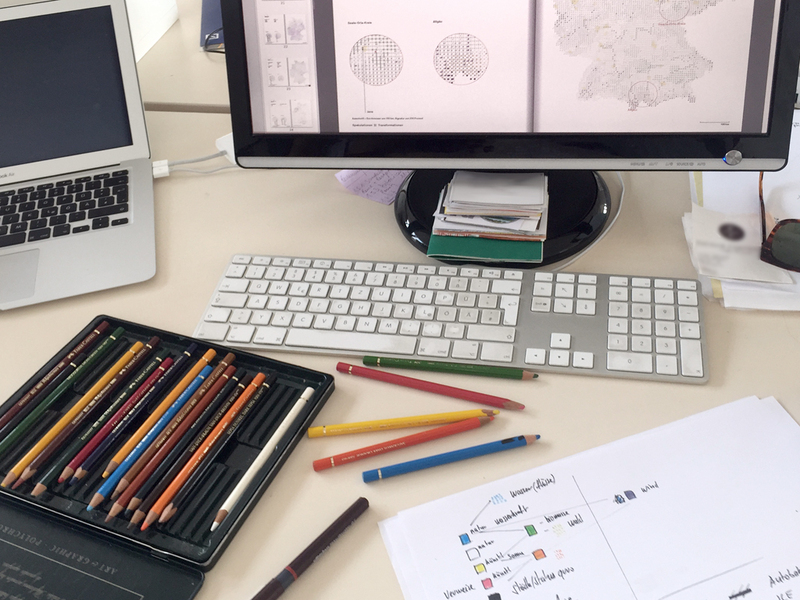 How to be formally consistent and develop a graphical vocabulary to make complex issues and correlations readable. 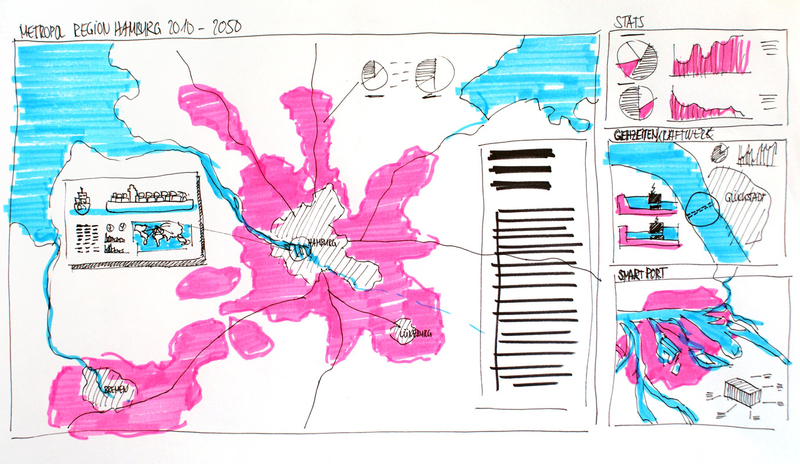 Sketch: Hamburg harbor – how to bring together the planning tools and method of representation with the scenario technique? 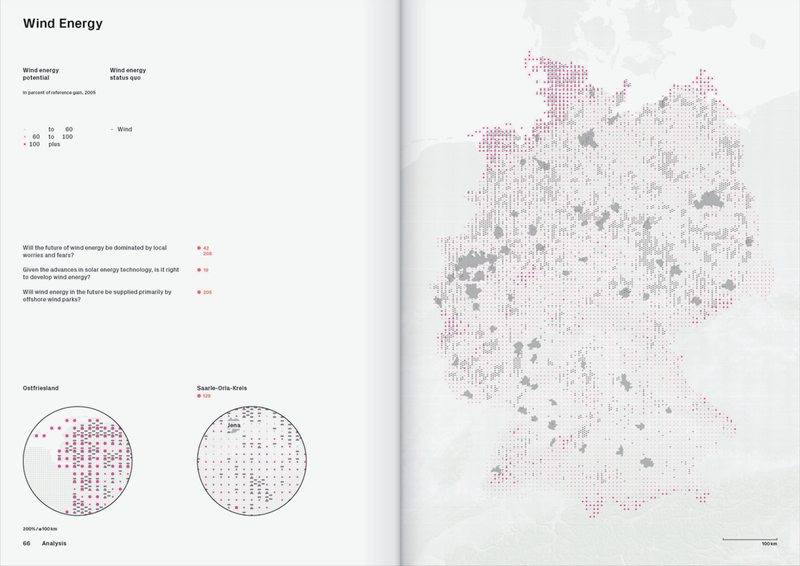 Using ongoing geographical and spatial observation materials, we have brought together a range of indicators in order to view Germany from different perspectives. 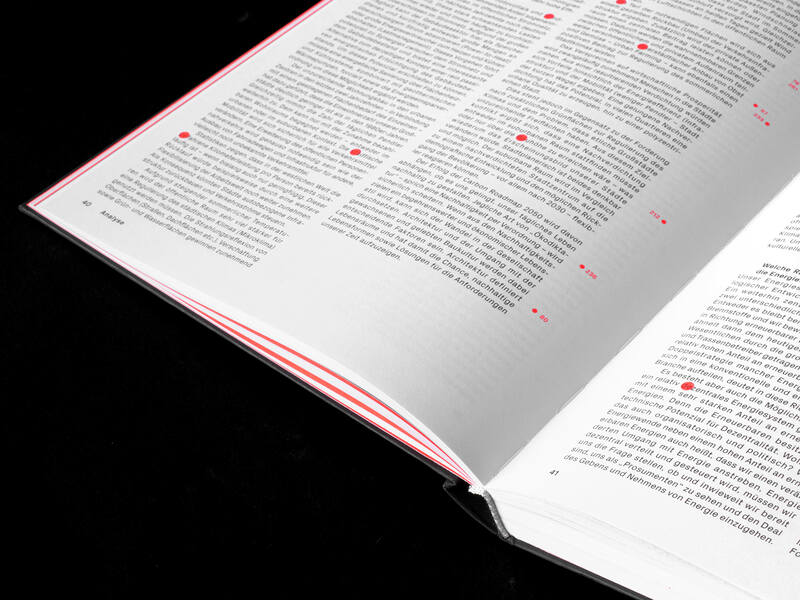 The graphics in the publication present complex interrelations uniformly and pictorially and make them easily legible. The basic principle underlying the diagrams is a grid that allows extremely diversified data to be formally systematized. 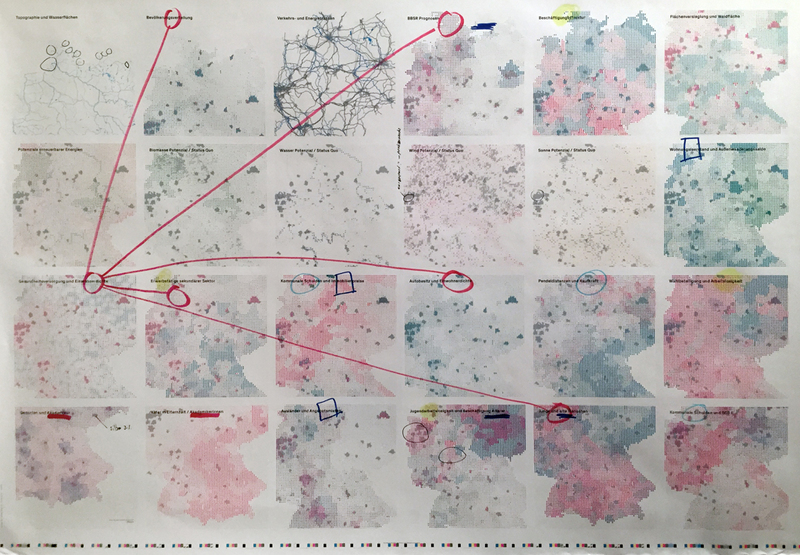 The fuzziness inherent in the grid-format of the maps makes harmonization of heterogeneous data sets possible. The macrospatial contrasts and tendencies that are brought out in this way provide a macroscopic view of Germany in its entirety. Population Development: Changes in population numbers 2010 to 2030. 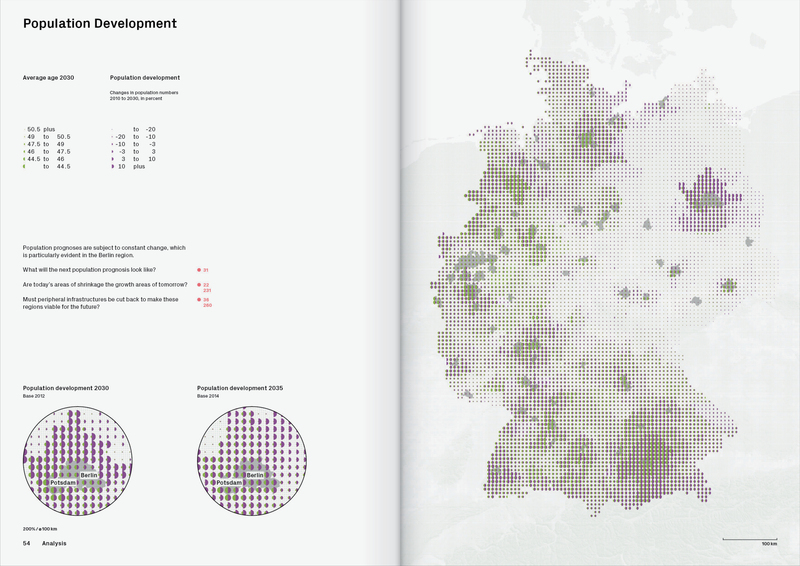 Population prognoses are subject to constant change, which is particularly evident in the Berlin region. 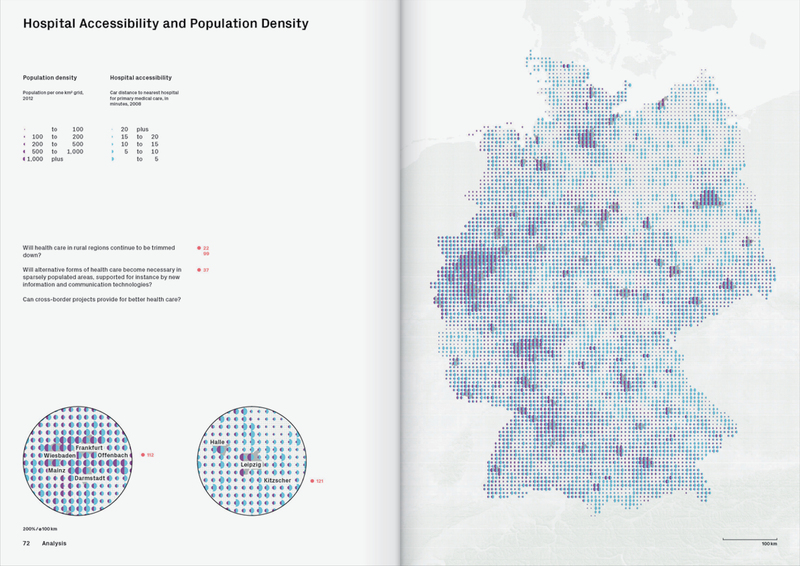 Germany is depicted in 7,269 squares measuring 2 x 2 mm, each of which represents an area of approximately 7.7 x 7.7 km. 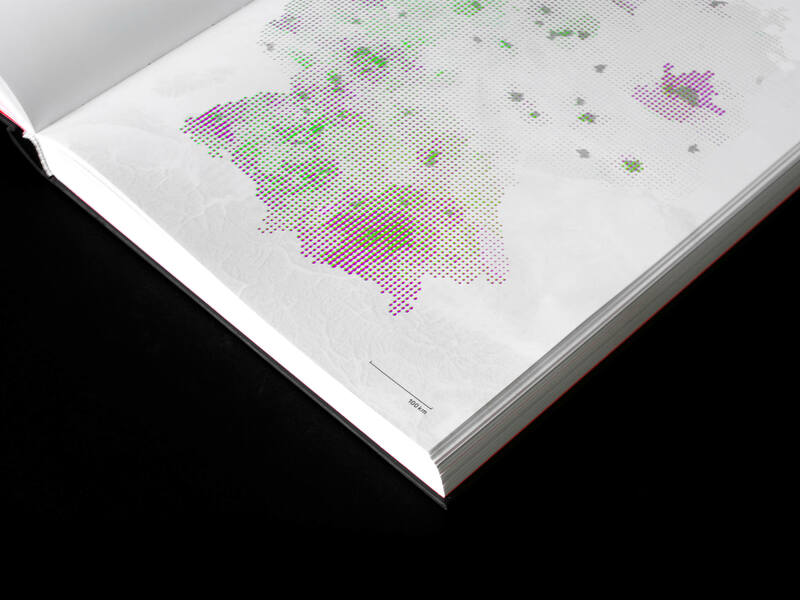 The data of the maps is represented by dots, semicircles, and lines of different density and size. 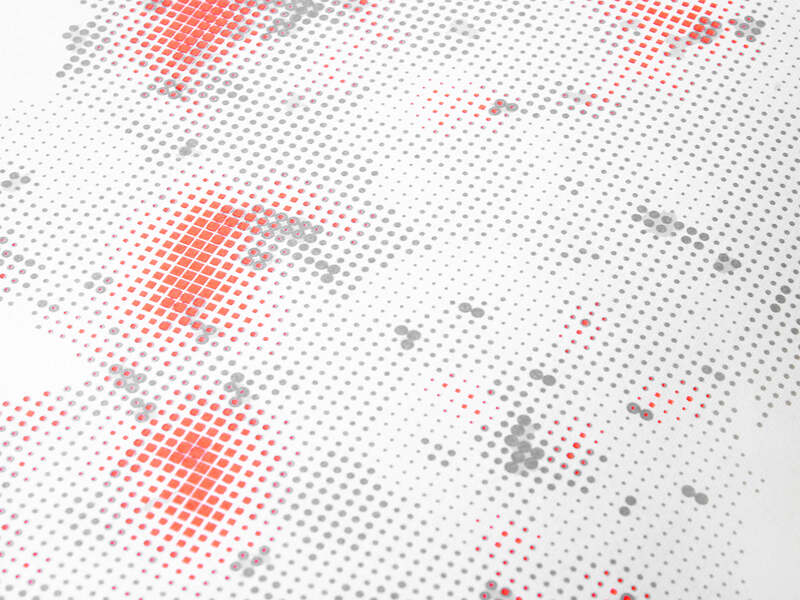 Depending on the data presented, one dot per square (frequency 5/cm) or four dots per square (frequency 10/cm) are used. Accordingly, different map data can be depicted by two semicircles or four different dot sizes. 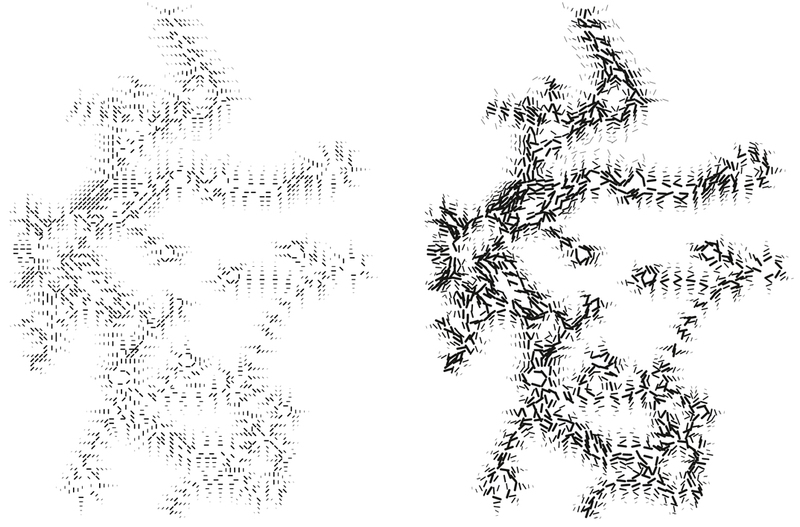 The different dot sizes express different densities of data. Additional levels of content are depicted within the basic gridformat by means of lines. 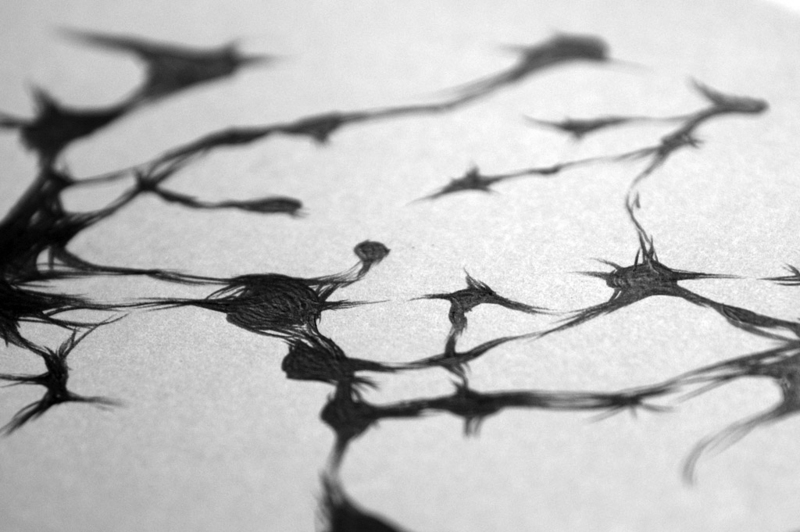 The grid as a principle of organisation allow us to unify a huge amount of informations within a formal and graphical system. 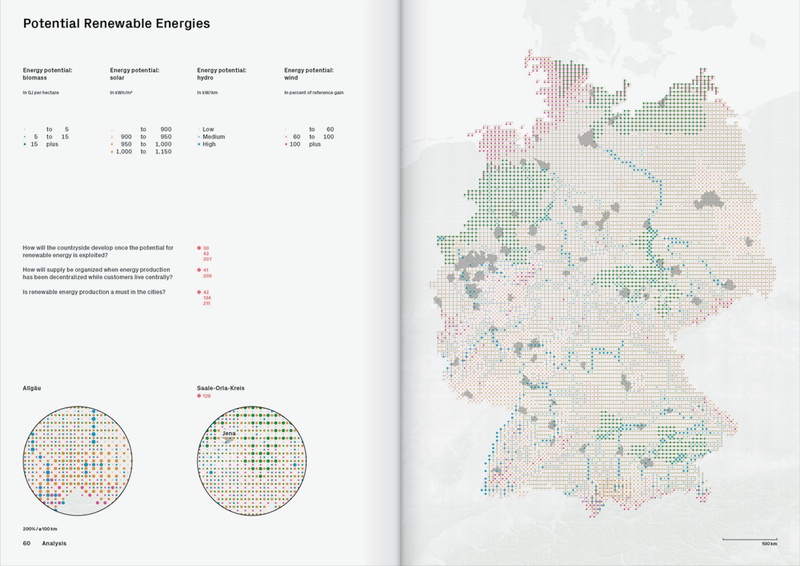 How might Germany change between now and the year 2050? 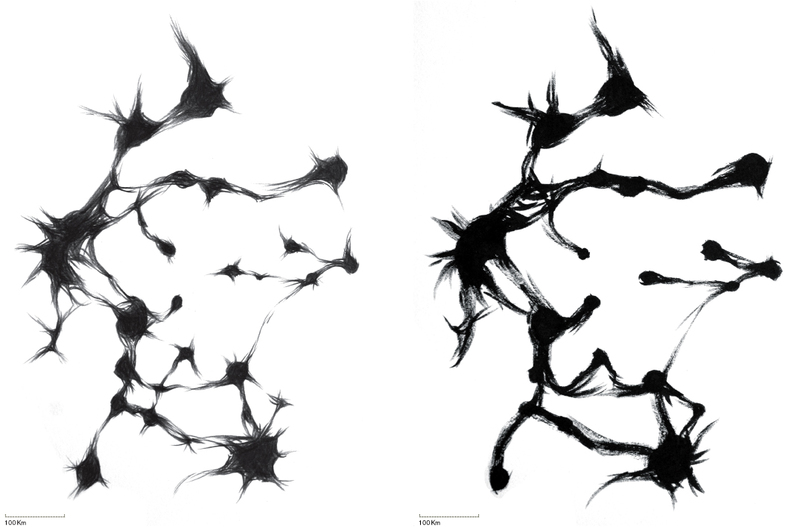 The speculations are the product of the Workshops conducted with interdisciplinary participants. On the basis of the preceding analysis, they run through three widely diverging paths of development up to the year 2050. 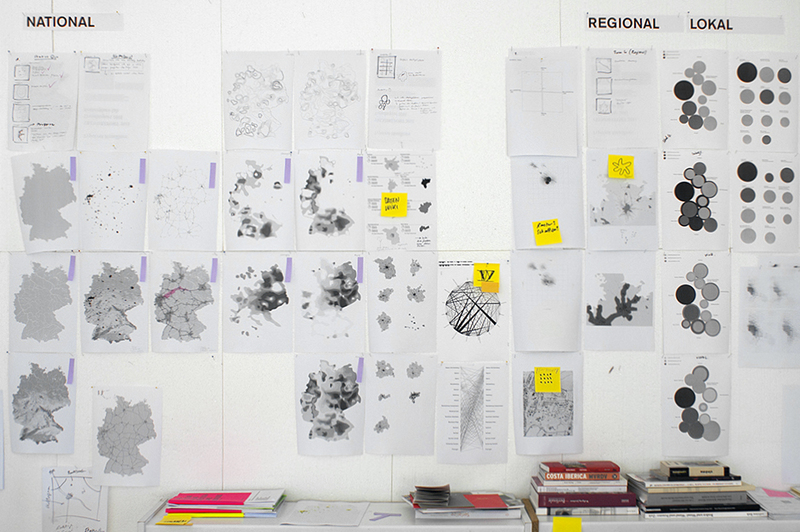 The possible spatial and geographic effects of the three scenarios are then localized and applied to six specific cities or regions. 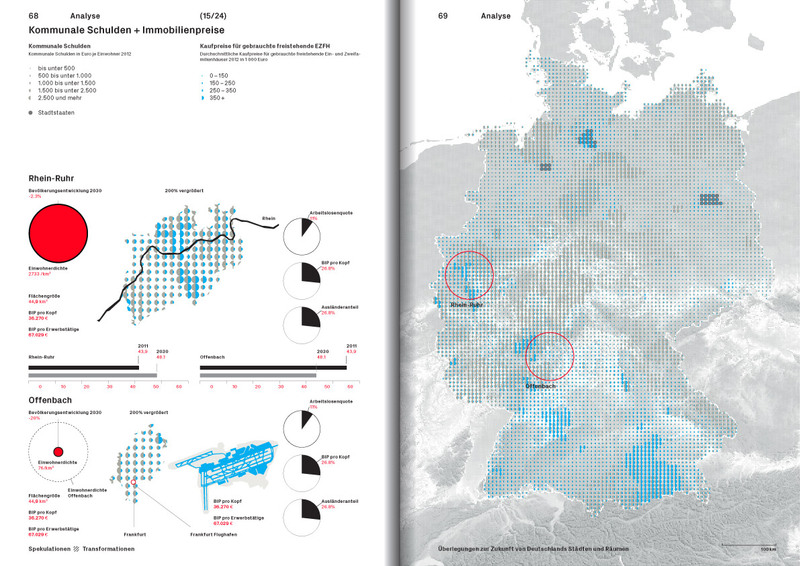 Speculations Transformations emerged from the “Baukulturatlas Deutschland 2030/2050” research project commissioned by the Federal Ministry for the Environment, Nature Conservation, Building, and Nuclear Safety (BMUB) and the Federal Institute for Research on Building, Urban Affairs, and Spatial Development (BBSR).